I was brave for this menu as I was serving it to a family member fresh off the airplane! She's such a good sport, though, and as it turns out, Mock Chicken Sandwich is pretty amazing! Phew! To make the Mock Chicken Sandwich filling I bought pork ribs, something I never cooked before. I'm just not that adventurous with meat, I guess... Anyway, I cooked one of the ribs in the pan, the rest I pan seared and finished off in the oven slathered with BBQ sauce, which my family was a big fan of. :-) I'm just glad they turned out! The next day I ground up the plain pork rib meat with the carrots, celery and mixed in the mayo and salt. 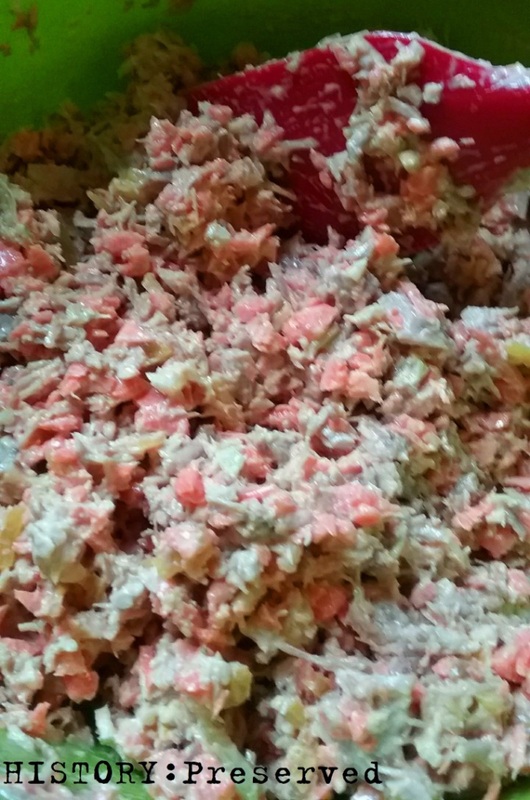 It's so simple, but wow, what a yummy sandwich filling! I'll definitely keep this one in my recipe arsenal. Does it taste like chicken? Yeah, it kinda does! 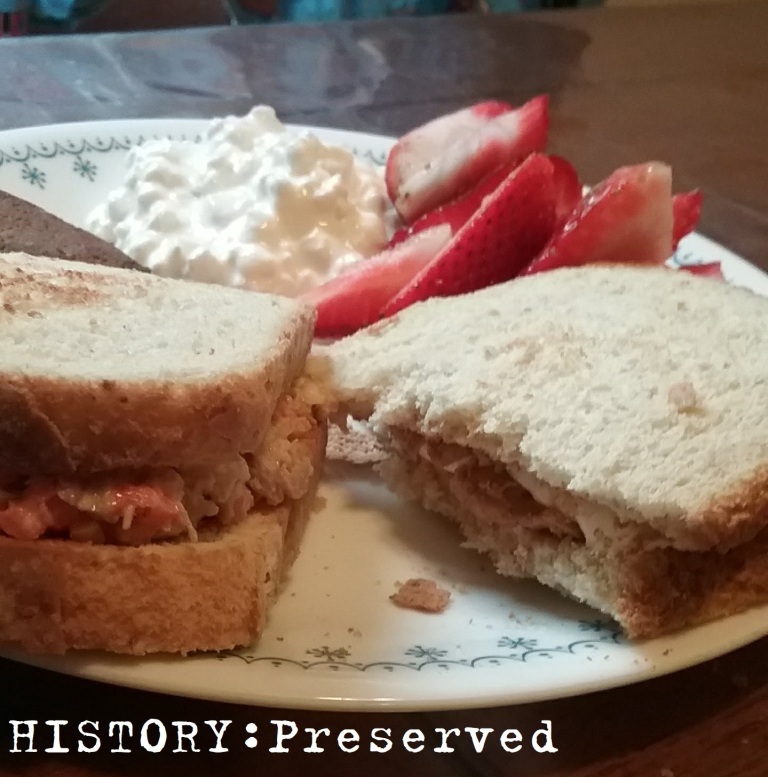 The second sandwich was supposed to be Peanut Butter and Bacon, but it was something I had tried during my last ration challenge, so I wanted to try another vintage recipe that was new to me. A friend mentioned Fluff marshmallow spread, which was popular in the 30s, and while availability of Fluff during the war was drastically reduced, I still wanted to give the infamous "Fluffenutter" sandwich a try. And.... it was kind of amazing! I'm hooked. 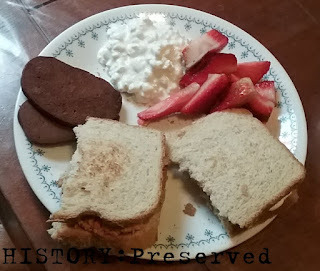 The idea of this sandwich has always given me pause, but I am a total convert to the pb & fluff now! Yay! As for the rest of the meal, I made the gingersnap dough earlier with my daughter. It's a refrigerator kind that you slice off the cookies to bake as you need. They were okay. The recipe calls for a whole teaspoon of salt, which is more than I like in my gingersnaps - or cookies in general. I used fresh strawberries which are in season and plain old cottage cheese. Overall, a nice little meal. I made the sugar syrup that's for the lemonade, but I still need to try that out. Maybe for the next meal! Wartime Menu Challenge - May's Menus Are Here!